Patchless glaucoma tube shunts can result in great outcomes—for the right patients. About 2 years ago, my surgical technique for glaucoma tube shunt surgery changed dramatically. Presented with the announcement by the Centers for Medicare & Medicaid Services that the agency will bundle and revalue tube shunt and patch graft surgeries at ambulatory surgery centers, I was motivated, like many other glaucoma specialists, to find a solution. This led me to learn how to perform tube shunt procedures without graft material. • Patchless tube shunt surgery has many advantages and is a worthwhile technique to adopt. As with any glaucoma surgery, however, successful outcomes demand excellent technical skill and proper patient selection. • In this case, multiple risk factors complicated a procedure that the author had successfully completed on other patients. • Patchless tube shunt surgery should be limited to patients with healthy sclera as well as thick, healthy, virgin conjunctiva that is freely mobile, has no scarring, and can easily cover the tube to the limbus. Furthermore, successful insertion of the tube under the sclera at least 4 mm posterior to the limbus at the 12-o’clock position is necessary for surgical success. I first heard of the patchless technique from a colleague who attended an American Glaucoma Society meeting. I researched and found the report of a technique of placing Ahmed Glaucoma Valves (New World Medical) without tube erosions in a large patient population.1 I began shifting the position of the tube from the 10- and 2-o’clock positions to 12 o’clock and putting the tube farther back from the limbus, but I continued to use my corneal graft tissue. Once I took the plunge and ceased using graft material, I became very excited about this new discovery. It offered many advantages, including fewer surgical steps, less suturing, a faster surgical time, and, in my experience, a faster visual recovery. It soon became apparent, however, that, as with any new surgical technique, proper patient selection was key, and the case presented herein highlights some of the lessons that I have learned (see at the bottom of the page). A 62-year-old white woman was initially referred to me by a retina specialist on May 11, 2016, for a glaucoma surgical consultation. The patient had an extensive prior history in her troubled right eye of a macular hole status post repair with vitrectomy, a resultant cataract, and a complicated cataract surgery combined with Trabectome (NeoMedix) surgery for mild open-angle glaucoma. She subsequently underwent an additional vitrectomy for a retained lens fragment. Prior to that procedure, her IOP was 51 mm Hg, initially managed with medical therapy, including acetazolamide (Diamox; Wyeth Pharmaceuticals). The patient had variable control of her IOP after the procedure, but as a chronic iridocyclitis developed, she became difficult to manage, as she was a severely sensitive steroid responder. Upon presentation, the patient’s BCVA measured 20/40 OD and 20/20 OS. IOP measured 42 mm Hg OD and 15 mm Hg OS, and central corneal thickness readings were 606 µm OD and 547 µm OS. The anterior segment examination was remarkable for a deep anterior chamber with rare cell, a posterior chamber IOL, and mobile superior conjunctiva in the right eye. The left eye was quiet and exhibited 1+ to 2+ nuclear sclerosis. On gonioscopy, the nasal quadrant of the right eye had 1 to 2 clock hours of open Trabectome cleft with scattered peripheral anterior synechiae; all other quadrants were open to the scleral spur. The angle in the left eye was open to the scleral spur in all quadrants. The macular findings were consistent with changes in the retinal pigment epithelium, but there was no open macular hole. Figure. 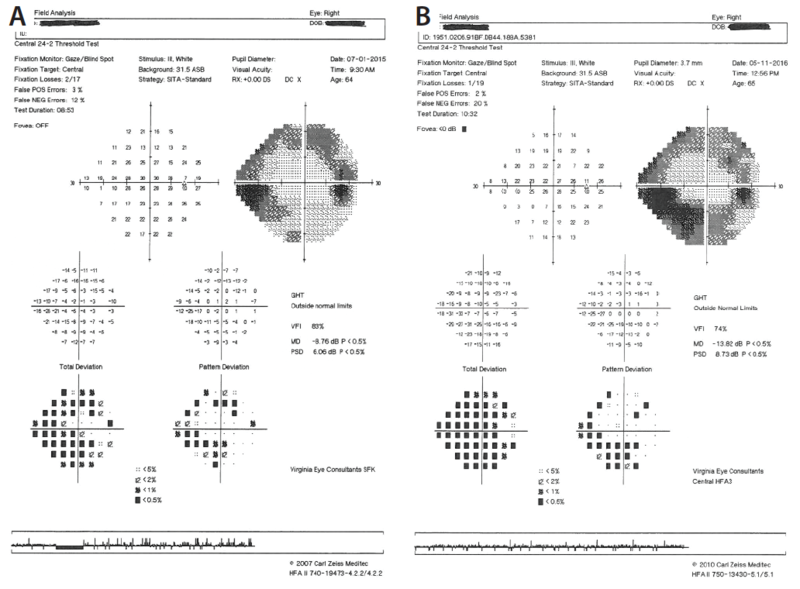 Humphrey visual field tests of the right eye in 2015 and 2016. The initial 2015 field (A) showed superior and inferior arcuate defects with nasal steps that in the 2016 field (B) showed progression inferiorly. An examination of the optic nerve revealed a cup-to-disc ratio of 0.8 OD and 0.35 OS. Visual field testing demonstrated progression from the prior year in the right eye (Figure) and a normal, stable result in the left eye. Optical coherence tomography showed corresponding retinal nerve fiber layer loss in the right eye and normal findings in the left. Because of the stage of the open-angle glaucoma, the scarred angle after Trabectome surgery, the maximal medical therapy, including acetazolamide, the chronic iridocyclitis, and the history of strong steroid response, I felt that the best option for IOP reduction was to place an Ahmed Glaucoma Valve in the patient’s right eye. At the time, I had successfully performed patchless tube shunt surgery. I therefore ordered a corneal patch graft to have available, but I planned not to use it if the conjunctival tissue were intact for patchless closure. I performed uneventful surgery within a week. Mild scarring from the prior vitrectomy proved easy to dissect. The freely mobile conjunctiva was not too thin, so I covered the valve without a patch. My technique is to make a scleral tunnel 4 mm posterior to the limbus in the 12-o’clock position and enter through the sclera to the anterior chamber or posterior sulcus with a bent 23-gauge needle. I then insert a beveled tube and tie it to the sclera in two places with a 9–0 nylon suture. Next, I reapproximate the conjunctiva to the limbus and close it with an 8–0 Vicryl suture (Ethicon) on both sides in a running fashion and centrally at the limbus. After surgery, steroid usage did not increase the IOP, but the patient’s clinical course remained complex. Hypotony required an injection of Healon GV (Johnson & Johnson Vision) into the anterior chamber 3 weeks postoperatively, followed by superior conjunctival wound dehiscence. I revised the wound 6 weeks after the initial valve placement and placed a corneal patch graft over the tube. The dissection was extremely difficult, with many breaks in the conjunctiva, making it challenging to completely cover the graft material. In the past, I have found that corneal patches that are epithelial side up can provide excellent tube coverage, even without full conjunctival cover. In this case, however, exposure occurred again. This time, it was not the tube but rather the plate because of a dehiscence in an area that was heavily sutured. The problem occurred despite the use of a large bandage contact lens to reduce friction. About 3 to 4 weeks after the first revision, I attempted a second revision with a larger corneal graft to cover the tube and the plate. To my disappointment, the procedure did not work. I felt that there was little chance of adequate closure over the tube that was leaking and causing hypotony that required another Healon GV injection. At this point, 4 months after the valve’s initial placement, I was concerned about leaking, infection, and failed closure, so I decided to remove the glaucoma drainage device and perform additional trabecular meshwork removal over a larger area with goniosynechiolysis using the Kahook Dual Blade (New World Medical). The patient’s IOP control was improved with topical medications after the procedure, but she had a persistent anterior chamber reaction and then developed endophthalmitis. Treatment was appropriate, and as the inflammation cleared over time, the steroid drops were removed. 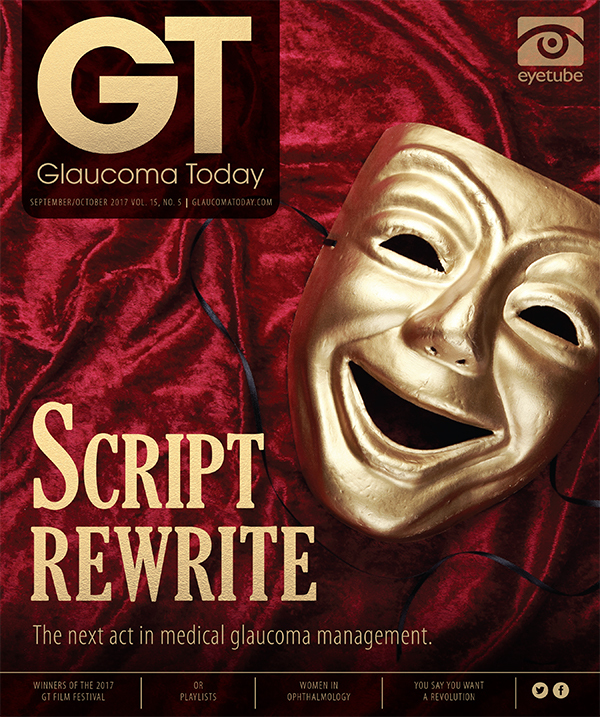 The IOP now remains in the low teens on two glaucoma medications. Unfortunately, her BCVA is 20/200 OD. Thankfully, her left eye has a BCVA of 20/20. Patchless tube shunt surgery has many advantages and is a worthwhile technique to adopt. As with any glaucoma surgery, however, successful outcomes demand excellent technical skill and proper patient selection. I always have patch graft material available in case I need to change the surgical plan based on intraoperative findings. This experience helped me define criteria that I use to guide patient selection for patchless tube shunt surgery. This patient had several attributes that contributed to her complications. 1. Prior conjunctival surgical manipulation. 1. Prior conjunctival surgical manipulation. Any prior trabeculectomy, tube shunt, retinal surgery, or other superior conjunctival surgery is a contraindication. Anything that can present scarred tissue alters wound healing when manipulated again and presents the risk of conjunctival breakdown (Figure). Figure. Referral case of a glaucoma drainage device requiring revision because of conjunctival erosion with multiple breaks (arrows) and thin conjunctiva. Tube shunt surgery was initially performed without patch graft material in a patient with a history of trabeculectomy with mitomycin C.
2. Anticipation of future conjunctival surgery. Ophthalmologists cannot predict the future, but if there is a strong likelihood of additional surgery, it is better to cover the tube with graft material. 3. Unhealthy conjunctiva. If thin or unhealthy conjunctiva is recognized preoperatively or discovered at the time of surgery, there is an increased likelihood of poor wound healing, dehiscence, or breakdown and exposure of the tube or plate. 4. Thin sclera. If the sclera is thin and the tube is not well covered by that tissue, there is a risk of tube erosion through the conjunctiva as well as other potential complications such as scleral perforation because of the need to be farther from the limbus. 1. Mesa-Gutiérrez JC, Lillo-Sopena J, Monés-Llivina A, et al. Graft-free Ahmed tube insertion: a modified method at 5 mm from limbus. Clin Ophthalmol. 2010;4:359-363.